Northern Stevedoring Services has loaded 21 830E Komatsu dump trucks on the cargo-ship Heino in Townsville. Port of Townsville said most of the 180-tonne trucks had been purchased from Century Mine, 250km north-west of Mount Isa, and they were transported by Australia Project Solutions. They were broken down for road transport. NSS carried out the stevedoring and Accord Logistics acted as freight forwarder, arranging the shipment to Mumbai in India. NSS operations manager Jeff Weightman said the load consisted of 27 containers and 285 individual pieces, including chassis, trays and spare parts. “There were heavy lifts – 50-55-tonne lifts,” he said. Mr Weightman said it was not unusual for NSS to deal with imports and exports of heavy earthmoving equipment through its Townsville, Mackay and Gladstone services. 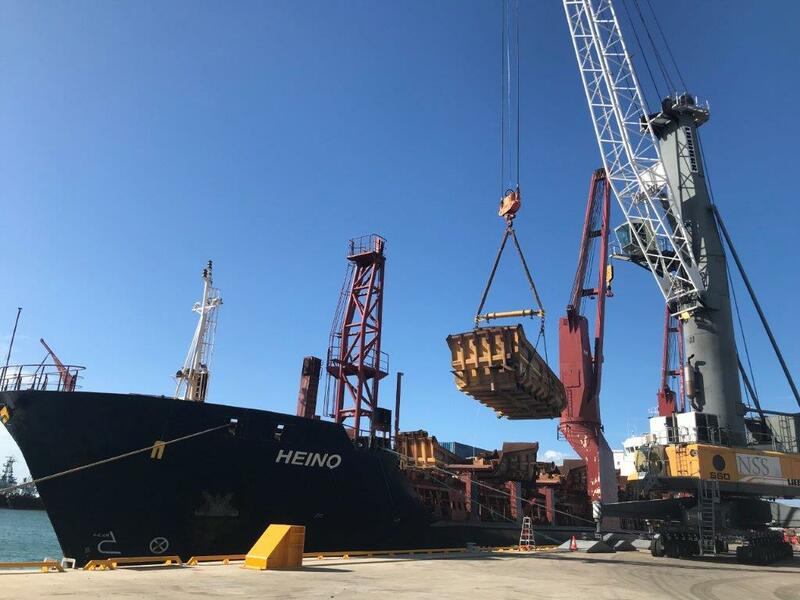 Stevedoring operations for the Heino cargo commenced on Monday and ran continuously through to Thursday. The second-hand trucks were acquired by Thriveni Earthmoving and will be rebuilt and used in India. The Heino is due to depart the Townsville port this evening (6.30pm).